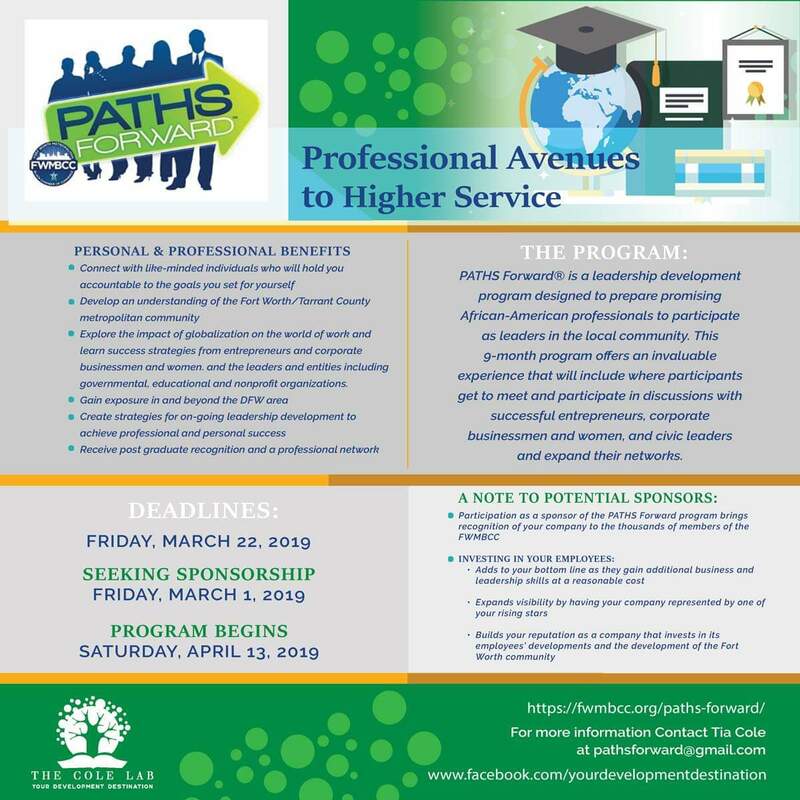 PATHS Forward® is a leadership development program designed to prepare promising African-American professionals to participate as leaders in the local community. 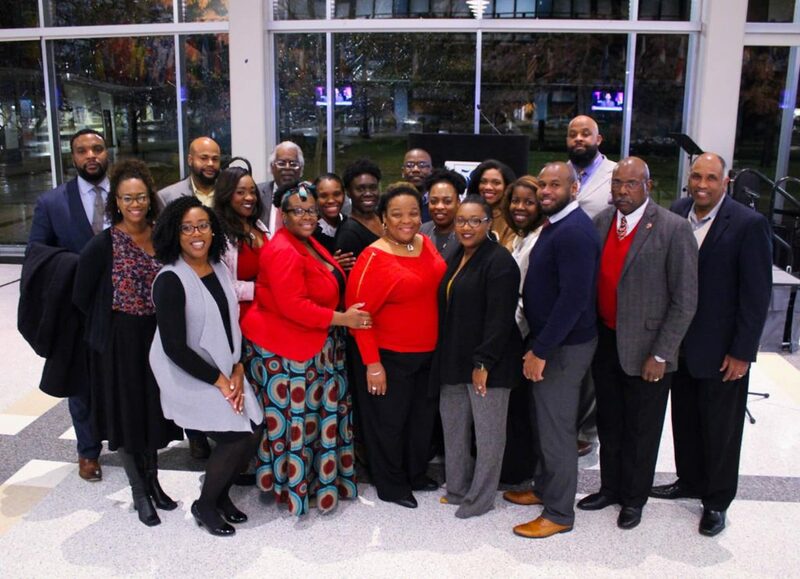 More than eight years ago, when it was noticed that very few African Americans were being selected to participate in the city’s most prominent leadership programs, the Fort Worth Metropolitan Black Chamber of Commerce leadership, President Devoyd Jennings, Chairman Glenn Lewis, former Chairwoman Norma Roby and member Dionne Bagsby, decided to address this obvious need in our community. Thus, the Chamber established PATHS- Forward, a program that would identify and train up-and-coming leaders in the Black community. It was first just a dream, but with the help of local foundations and corporations, the Chamber was able to fulfill that dream with remarkable results. 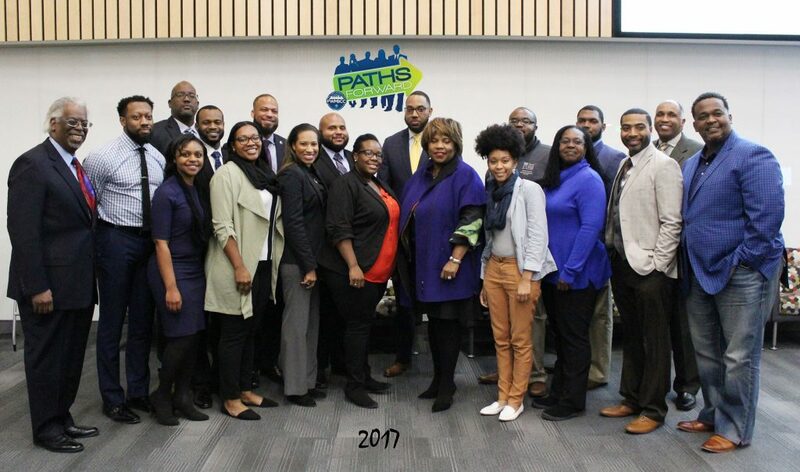 Since its establishment in 2009, PATHS Forward has graduated more than 100 participants, helping to introduce young African American professionals to basic leadership skills, volunteerism, the Tarrant County community, civic and governmental structures, the concepts of working with non-profit organizations and the roles of institutions like our public schools and public health systems. 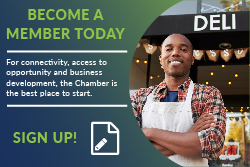 The Chamber is proud of all our former graduates, many of whom we’ve watched take prominent leadership positions not only in their places of work, but also on community boards, commissions and committees, including the board of directors of the Black Chamber. The FWMBCC graduated its ninth PATHS-Forward class in December 2018. Gained an appreciation for how their personal strengths, talents and weaknesses impact their leadership capabilities. Honed effective, persuasive speaking skills through the exploration and adoption of innovative strategies for oral, written, and non-verbal communications. Developed an understanding of the Fort Worth/Tarrant County metropolitan community, the leaders and entities including governmental, educational and nonprofit organizations. Created a service project that positively impacts the community. Explored the impact of globalization on the world of work and will have learned success strategies from entrepreneurs and corporate businessmen and women. Created strategies for on-going leadership development to achieve professional and personal success. 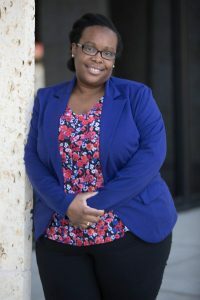 The PATHS Forward® program developer and facilitator is Tia Cole of Omaha, Nebraska where was top of her class all throughout school, a challenge, honor roll, honors, and AP student, and the first in her family to complete a college degree. Tia has always known that education and the power thereof would be her focus from a very early age. She earned a Bachelor’s Degree in Education & Human Sciences with a focus on Secondary Education and English from the University of Nebraska-Lincoln (UNL). Later, she received her Master’s Degree in English. She has created curriculum and programs as well as hired, trained and supervised tutors and instructors. After graduating PATHS Forward class of 2015 and Leading Edge class of 2016, Tia decided it was finally time to Launch The Cole Lab. This entrepreneurial pursuit is committed to being your development destination for education, literacy, leadership, and employment. The focus of this company is on programming, curriculum design, coaching/training, and facilitating self-sufficiency. The website is on the way. And, you can learn more about what The Cole Lab can do for you at www.facebook.com/yourdevelopmentdestination. In addition to launching her development business, Tia serves on the executive board of BRIDGE Fort Worth as the Professional Development Chair; she serves as a board member for the Fort Worth Public Library Foundation; she serves as Education Committee Chair and executive board member of the Arlington NAACP, and she is an immediate past board member of the Ladder Alliance. Tia Cole is deeply committed to change through engagement and action. Tia ushered in the 2017 class of PATHS Forward as the new program director and facilitator to carry on the legacy of Mrs. Paulette Turner, and she invites you to take advantage of this life-changing opportunity.